Challenge: Student wanted to create a personalized storage holder for storing stationary items to assist her in the classroom. Student was looking to venture towards creating something that was significant and would require extensive design and finishing to create a finished piece that the student would be extremely proud of. The student has proven time and time again in the classroom to be a student with artistic design and creation. She was adamant right from the onset of this project about the colours and the design. She oversaw the entire project which had little or not input from the teacher (other than suggestions about the size). 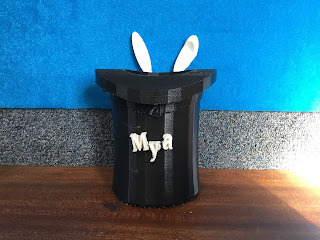 The design came from a prepared source - the hat was a standard Tinkercad design as were the rabbit ears, the student was responsible for the name. This is the design before final finishing. The lettering in question is held in place by blue tack and requires finishing including the use of sandpaper. The ears are also in place in the photograph as a trial as the student wanted to experiment with the placement of them relative to the design and placement of the name etc and consider whether or not to add additional features to the design. Level of Difficulty: Medium - despite the scale of the project and the finishing the 3D Printing element of the project was straightforward based around the three key elements - the name, which is very straightforward, the hat - which came from the main Tinkercad interface, as did the ears. The difficulty with this project has come with the finishing, given its scale it required significant rafting, and rafting removal, which left some damage to the hat (which was not particularly visible as it was produced, deliberately in black). The student is intending to have it spray painted to touch it up and was to use sandpaper to improve the finishing on the name and the ears. Time frame: This print is not for the faint hearted and was never intended to be anything less. The ears and the name came in at a hour and the hat as a single piece took twenty two hours to complete as a single piece. This was at a 20% infill with the usual 8mm nozzle. Size: The piece was 140mm high and 100mm across. It was particularly thick with a significant depth to its sides. This came as part of the design from Tinkercad and the student choose not to alter this to affect the overall design. What we would do differently: The biggest issue of a print this size would be the amount of rafting that it produces which is excess or waste plastic. In this case the lip of the top hat, which creates the entire affect of the design. There was a significant amount of plastic that ran the length of the design that needed to removed - it caused damaged to the hat. Ultimately it could have been designed in component pieces that would have allowed it to minimize both but the student wanted to simplify the process.